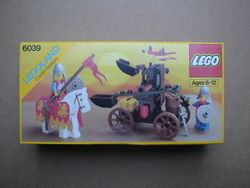 6039 Twin Arm Launcher is a Castle set of the Crusaders faction released in 1988. The set contains 73 pieces and instructions to build a double-armed catapult, a horse and two Crusader soldiers. A lightweight, double-armed black catapult was the subject of 1987's 6039 Twin Arm Launcher set. The hinged, "finger-powered" catapult arms on the four-wheeled rig hurled 1x1 yellow bricks as ammunition, and was manned by two Crusaders knights, one on horseback. This was the first Castle Set to include a barding covering for the horse. Facts about "6039 Twin Arm Launcher"
This page was last edited on 28 April 2016, at 22:03.